I love the holidays. There’s so much going on, family to cherish, memories to be made, food to enjoy, and so much more! I’m going to go back to all that food to enjoy for a minute. Now, I’m all about eating healthy, but I do think it’s ok to splurge and allow yourself treats here and there. If we don’t, then we will end up indulging beyond what we should. So while we are getting over Thanksgiving and heading into the Christmas season, why not take a step back and get your system back on track? It’s easy to say, “Well, I’ll just wait until after Christmas to start back on my diet.” I’m here to tell you, that is a lie. How you eat is second nature. In order to change what your nature leans toward, you sometimes have to stop dead in your tracks and go a different route. So when I found this recipe, I knew I had to share it for Monday’s Menu-Fall Detox Vegetable Soup. When I get in a busy season and am not making the best choices food-wise, I love taking a few days (preferably during the week) to clean out my system and give it a reboot. This helps me get rid of cravings (my nemesis is sugar and sweets), clean out my digestive tract (which will make you feel better as well as give you many other benefits), and jump start my nutrition to a better way of eating. 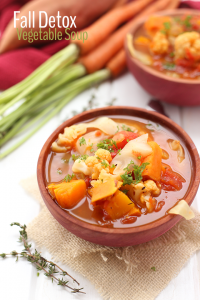 That’s why I love recipes like this fall detox vegetable soup. It’s real food, so you’re getting the nutrients your body craves, but you’re eating things that will give you the benefits of a juicing cleanse or using supplements to clean you out. This will be on my menu for this week. I hope that you enjoy it, and that it helps you feel better and make better choices with your nutrition during this busy season of the year. 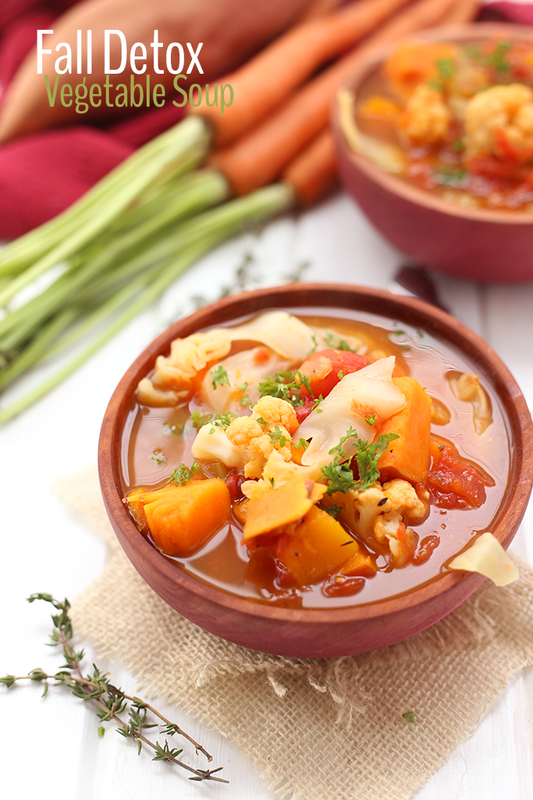 Enjoy this offer today on Monday’s Menu-Fall Detox Vegetable Soup.